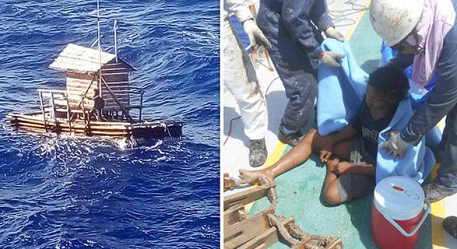 An Indonesian teenager who has been survived for 49 days at sea by cooking fish on wood taken from his vessel, it has emerged. Aldi Novel Adilang was on the 125km (77 miles) off the Indonesian coast in mid-July when heavy winds hit his moorings to snap, casting the 18-year-old adrift. Guern, where he was finally picked up by a Panamanian vessel. The 18-year-old, from the Indonesian island of Sulawesi, worked on a "rompong" - a floating fish trap without any paddles or engine. His job has been to light the rompong's lamps, which are designed to attract fish. The trap, which is shaped like has a floats in the middle of the sea but is anchored to the seabed by ropes. Every week, the teenager would come to the fresh food, water and fuel. On 14 July, Mr Adilang's rompong was hit by heavy winds, which caused his moorings to snap. He just got a few drinks left, so he caught the fish and cooked it by burning the rompong's wooden fences. It is unclear how he remains hydrated. "[He] said he had been scared and often cried while adrift." 10 ships had sailed past him. "Every time he saw a big ship, he said, he was hopeful, but more than 10 ships. None of them stopped or saw [him]. " His mother told AFP how she learned of her son's disappearance. "His boss told my husband that he was missing," Net Kahiking said. "So we just surrendered to God and kept praying hard." On August 31, Mr. Adilang sent an emergency radio signal upon seeing the MV Arpeggio nearby. He was picked up by the Panamanian vessel off the waters of Guam.